Claude Puel thinks James Maddison is getting better with every game after the midfielder led Leicester to a 3-1 victory against Huddersfield. The 21-year-old, who has been tipped for an England call-up in the future, produced an impressive performance and capped it by scoring a powerful free-kick which sent Leicester on their way to all three points. Maddison, who started on the left flank. has now either scored or assisted in four of his last five Premier League starts City (3 goals, 1 assist) for Leicester and Puel was delighted with the young Englishman's contribution. "He's improving game after game which is a good thing," Puel told Sky Sports. "He scored a fantastic free-kick and I am happy. I want my player to have the creativity to find solutions on the pitch. It was a good opportunity for him and I am happy with him. "I'm happy about the player also because we remained in the game in difficult conditions. To win this game was tough but it's a fantastic feeling at the end." Leicester ended a run of two straight Premier League defeats with victory against Huddersfield but they had to do it the hard way after going behind in the fifth minute to Mathias Jorgensen's strike. Kelechi Iheanacho quickly equalised, marking his recall to the team with a goal, while second-half goals from Maddison and Jamie Vardy sealed victory. 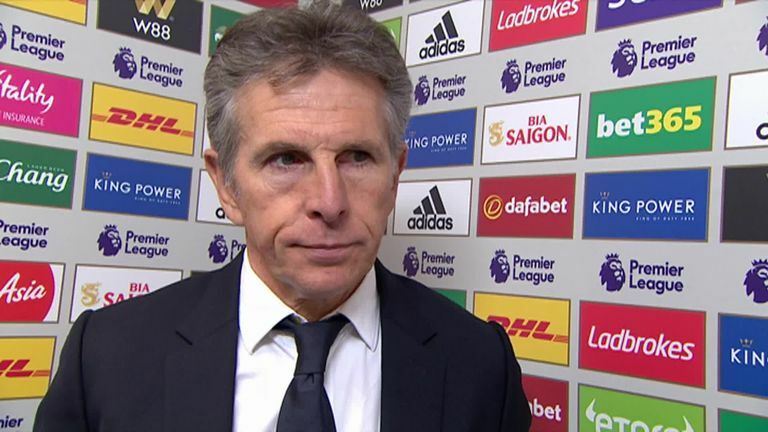 Puel was delighted with the character his side showed in producing their comeback but insists they need to improve how they start games after going behind to another early goal. "It was a bad start," he said. "Often we are having some difficulties starting our games, conceding chances or goals. "It's always difficult to come back in the game against a team with a strong defensive unit. It was complicated but I'm happy about our desire, our mentality and our strength to come back under these conditions. "It's a good thing but of course I would like to prevent this with a better start because sometimes it's too difficult to come back into the game. We have to correct this situation." He added: "We have good quality all over the pitch. We have good defenders, good midfielders and good attackers, that's not a problem. However, often our starts are not enough and we have to correct it because in the next game it may be difficult to come back. "We need to improve our mentality at the start of the game. We will try but the good thing at the end of the day is to win, have a good result and have this strength and mentality in the team to come back." Pick your Sky Sports Six-a-Side team for a chance to win the guaranteed £1k jackpot.